To start – this is truly an incredible workbook! For 35 years I helped to organize education programs for medical group practices throughout the US. The one thing I explained to all speakers was that their handouts absolutely needed to provide practical, how-to information that could be implemented immediately upon return to the office. That’s what this book does! It provides a biblical step-by-step method for discovering God’s will for your life. Ephesians 5:15-17 says we should walk circumspectly, by being wise and redeeming the time by understanding the will of God. James 4:14 says that our lives are but a vapor that appears for a little time and then vanish away.” Time is short, folks, now is the time to get in step with God’s perfect plan for your life. RE-VISIONING will take you through the process to do just that. If I could give this book a rating, it would be 5+! Thank you for providing a tool that individuals can use to get it right with God! I was introduced to the Re-Visioning workbook back in April 2017. I was greatly blessed by the time I completed the workbook. The book takes you on a step by step journey that helps you assess where you are with God currently and helps you decipher what direction God has for you personally, your family and your ministry. It is very simple format and yet very profound. Every aspect of the workbook is completely based on instructions from the Bible. I guarantee that by the time you complete the workbook, you will hear from God even if you haven’t been used to clearly hearing from God in the past. The workbook can easily be completed in one day, without any distractions or over a couple of days. 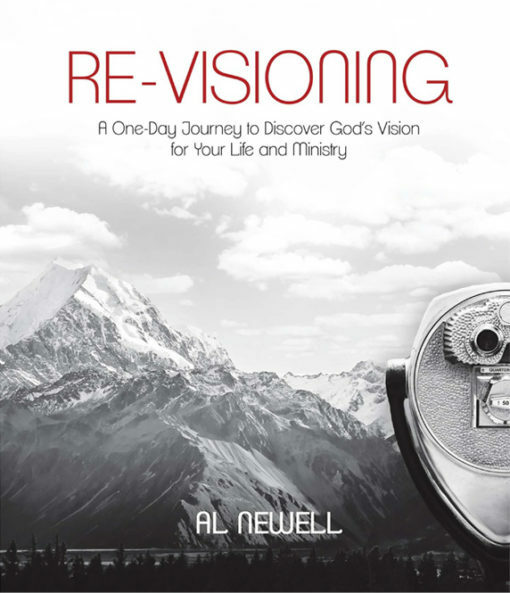 Since April I have given away 5 of the ReVisioning books to friends in the Lord and referred family and others to the website to purchase it. It has been a HUGE blessing to those who have gone through it. We have all been very blessed by this ministry. I couldn’t be more grateful to have been introduced to Re-Visioning! When I received my copy of Re-Visioning, I initially had concerns whether I’d be able to finish it in one day. To my surprise, not only was I able to complete it all in a day, but I had plenty of time to dive deeper into the suggested scriptures. The design, scripture and stories shared in this book really set me up well to spend quality time with the Lord. The Lord used this book to shine light on areas of my life that needed to be further explored. This book also highlighted the consistent themes in my life, allowing me to begin to discover God’s calling and plan for me. As a result of my time with the Lord and this book, I’ve been able to pursue the things I believe God is calling me to. I’ve also experienced a deeper and more focused season of prayer. Simply put, Re-visioning is a must read/exercise for me very year! This is an excellent resource that guided me to the heart of God. I completed it over two afternoons in a quiet local church prayer room. Rather than diving right into seeking discernment, the sections focused on a time of reflection, confession, repentance and praise. That opened my heart to hear more clearly from the Spirit. I was in a time of discerning if God was calling me to step out of my comfort zone of a long-time ministry career to take risks on a new ministry venture. Physically writing down my fears and then praying through them gave me the courage to come to the YES conclusion and trust God. I am now giving this book to others I serve with in ministry, and it’s been a transformative tool for them as well.